Direct reading of torque values for all kinds of small screw tightening. 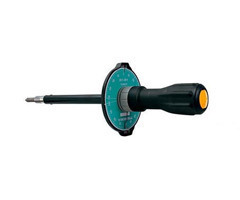 Basic model of direct reading type torque driver. Suitable for inspecting tightened screws. Used for inspection by loosening torque and re tightening torque methods. Memory pointer shows the maximum torque applied. T-bar is standard accessory for FTD8N2-S and 16N2-S.
Applicable to use in the EU region. Comply with calibration procedures of ISO6789 Type I Class D.
FTD8N-S, 16N2-S: Square drive type (6.35mm). For FTD8N2-S and 16N2-S, bits are supplied as standard accessory.